Burhan Sonmez is one of the most interesting voices in modern Turkish literature. His book Istanbul Istanbul is one of my favourites and recently won the EBRD prize for literature. As a result, I was deeply honoured when he agreed to meet with me to discuss his writing and work as a member of the activist group PEN International. Luke: Burhan, thank you very much for agreeing to meet with me. Luke: I’m very excited about this one. I loved Istanbul Istanbul. Luke: Yea, and I’ve read Sins and Innocents as well. I don't think North is out in English yet. Luke: Are there any plans for it to come out in English? Burhan: There are some plans but we are taking it very slowly. Luke: Ok, that's fair enough. To start with I’d like you to say who are you and what do you do? Burhan: I’m a Turkish-Kurdish novelist. I was born in a small Kurdish village and I moved to Istanbul, I studied law and then I worked as a lawyer for a few years. I moved to Britain for political reasons. I lived there for about ten years as a political refugee, then I returned as a novelist. I wrote books when I was in Britain. Then I started to pursue a life of writing in Istanbul. Now, mostly, I stay in Istanbul and partly in Cambridge. I go back very often. That's my life. Luke: What drew you to writing novels? Burhan: That’s a very difficult question for me to answer. Like every young man here, I used to want to be a poet. I used to write poetry when I was at university but then I was in Britain, stuck there, just reading and writing, so I felt that I could write a novel. I don't know what brought me to that point. I just remember the feeling. Luke: How was the process? Burhan: The process was very long. My first novel took me ten years. Because when you are away from home, in exile, the current of time is a bit different. You don't feel it. On one hand you feel it very heavily, on the other hand you feel it very lightly. You don't rush for some things while you are rushing for others. When it comes to writing novels I didn't rush because I was away from home. I didn’t know if I’d be able to come back to Turkey at all. I asked myself why I should rush my novel so I just enjoyed writing it. Luke: In Sins and Innocents the theme of that novel is about people in exile who have either chose to stay away or can’t return to their homes. Is that what you were going for when you wrote that book? Burhan: Yes. That book isn’t autobiographical but I wanted to write about a person who very much resembled me, but was not the same because it is something else if you want to portray yourself in a book. You have a different challenge. On the other hand, when people read that book, some people confuse the protagonist with me because the names of some people, some places are the same. Luke: Yes, and Cambridge [where most of Sins and Innocents is set ed.] isn’t a very big place. Burhan: Yes and also the Kurdish village and community here. I wanted to have another person very like me. Luke: My favourite book of yours is Istanbul Istanbul, which is an absolutely incredible book. What made you want to write about incarceration? Burhan: My first thought was not to write about that. I wanted to write a book about Istanbul, about how can we see Istanbul from different points of views. When we write about Istanbul from the west, we see the east. When we write about Istanbul from the east, we see the west. But what about if we write about the city from the underground? What can we see from below? There is no east or west, north or south there is only upward and only the sky and the real Istanbul. Then we start to question the reality when you are underground and in pain. I put my characters in a small cell three floors underground, so the only place they can want to go is just above ground three floors up to Istanbul. They start to talk about Istanbul, while suffering horrible pain. Luke: That book isn’t set in a definite time. You don't make it very clear. Luke: I wonder if it was supposed to be speculative or if it was talking about the universal city. Burhan: I think I wanted to have the feeling of a few generations of Turkey in a single book because that kind of prison or pain story is not just a single generation in Turkey. When we look at the 1968 generation, we see that they suffered a lot and the 1978 generation, the 1980s, and the generation of today. When people of different generations read this book then everybody says ‘oh you talked about our generation, our experience, our feelings.’ In the beginning, when I heard these kinds of comments, I felt proud. I felt that as a writer I was capable of bringing out feelings in different generations. On the other hand, suddenly, I realised it isn’t magic, it is a painful reality in Turkey because if you mention a certain kind of pain, you can see it suffered for generations and generations. Luke: There is an awfully circular nature to Turkish history. Burhan: Yes. That's a bit sad. Luke: That was definitely something I got from your book. You have these periods of freedom and periods of oppression and going into the future it will keep repeating. I’m curious about how you wrote it. Istanbul Istanbul has lots of fables, long jokes and memories in it. Did you write the vignettes and then work on connecting them, or did you come up with the overall structure and added them in? Burhan: The way I write is that I have a general frame idea. I know the frame in my mind. I start taking notes about some scenes, places, stories and characters. The first page in the first chapter takes me one year. Because when I write the first page I think about the rhythm, the melody of the words and the combinations of verbs and adjectives and the forms of the sentences. Through that one page that takes me one year, I see the whole book in a mirror. After finishing the one page it is so easy to write the rest. It might take me five years to write the book but much easier than the first page. Luke: There is a character in The Plague [Joseph Grand ed.] who is constantly writing the first sentence of his book forever. Burhan: Maybe that is the real writing. Luke: I’m curious. Books like yours, with unusual structures and lots of stories within stories often don't connect together very well. But yours does. How did you establish that flow? Burhan: It's a bit difficult. 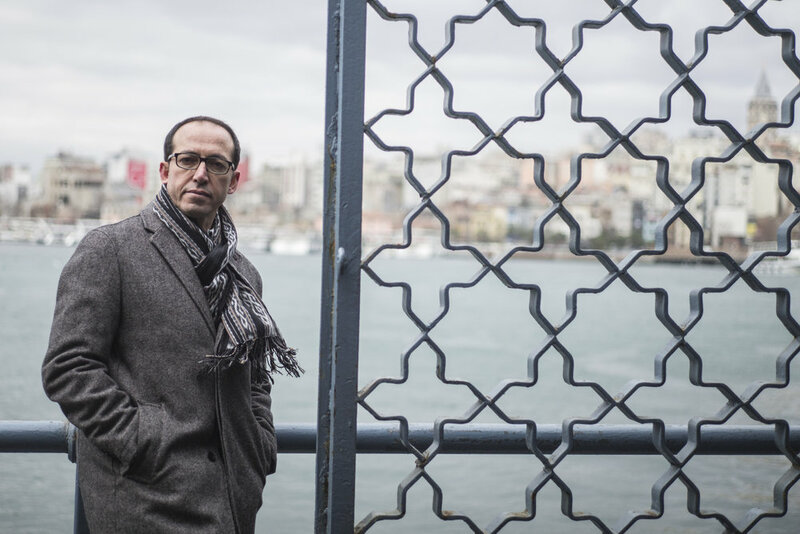 Burhan: When it comes to writing, my mind works in a kind of complicated way. I like to think of a lot of little stories at the same time and try to find connections between them. When I was writing this book it was not a problem writing stories and finding connections between them because I’ve got two hundred stories in my mind. [I think I made a little gasp of amazement here ed.]. My problem was how do I bring them down to just twenty and which ones should be out. It takes time. Luke: I’m sure it must. So often these kinds of stories end up being quite obscure. It is impressive that you were able to have all these stories and an overall narrative. Your book is not only interestingly structured but also beautifully written. Can I read you a quotation? I love that line. Just for me personally, what were you thinking when you wrote it? Burhan: I came to Istanbul when I was seventeen years old. I came to study at university for the first time in the city. I was kind of mesmerised. I said, ‘This is the city. I’m in love.’ Since then I perceived how Istanbul has changed throughout history. When it comes to today, it is the same as when I wrote this novel five years ago, you see so many constructions and demolitions. They are changing everything and they love to see new skyscrapers. On the other hand, everybody is in love with old Istanbul. They are kind of conservative about the city. For example, they love old Istanbul paintings. On the other hand, they destroyed the current remains of old Istanbul. Luke: That quote puts into words a lot of my own frustrations with this city and the way it is. You go to people’s flats in modern high-rise buildings and you find all these old paintings of the Bosphorus. It's a very strange contradiction. Lets move onto my next question. The book is about imprisonment and torture. But you shy away from describing the torture itself. It all happens off-stage as it were or is described by the characters when they return from it. Why did you choose to do that? Burhan: Because I was not interested in torture or the feelings torture gives you. What you feel before and after torture was the main thing for me, because at that point you can see the invisible side of a personality: Our fears, our hopes, that kind of thing. I wanted to keep the story around that circle. Luke: Ok. So there has always been a genera of ‘prison literature’ from books like Moll Flanders or One Day in the Life of Ivan Denisovich and also, depressingly, in a lot of modern Turkish and middle eastern literature. Do you see Istanbul Istanbul as part of the genre of prison literature? Burhan: I think partly. You know in current modern literature we usually don't borrow a certain genre. We like a combination of different genres. I would like to see this book as partly prison literature and also architectural or urban literature. The soul of a city, what makes a city like Istanbul itself? When you read the notes of Herman Melville when he came here, or Gustave Flaubert or Hemingway you see that everyone is talking about the city. You know that you are in that city at that moment, but it’s not the same city. You try to picture it in another way. From that point of view it can also be seen as urban literature as well. Luke: How do you see it as part of Turkish literature? There is kind of a lot of short story writers in Turkish literature. Obviously, Sait Faik springs to mind. Do you see yourself as part of that tradition as well? Burhan: Story telling is a strong pattern in this book. I wanted to bring our traditional story telling into a modern frame of literature, to have a bridge from story telling and short stories to the modern novel. Luke: More broadly in your work Istanbul Istanbul and Sins and Innocents I found it to be about story telling. Is that accurate? Burhan: Yes. My first novel North as well is in the same style. Luke: What makes you want to write about story telling? Burhan: That's a question I ask myself because it’s not the case that you think ‘I should write in that way.’ You find yourself that you have been writing in a certain style and then you start to understand yourself and why you write in a certain way. I think it comes from my cultural origins because I come from a Kurdish origin and grew up with Kurdish stories and fairy tales, which were forbidden and impossible for us to find a written version of. Then I learned Turkish in primary school. Then you start to write in Turkish, not in your mother tongue. I think your subconscious keeps your mother tongue and your mother tongue’s way of story telling influences your literature. That's the thing that Yashar Kemal told me. When we talked, he told me, you have the chance that I’ve got, we both have our mother tongue but we have to recreate it in another language.’ Rather than seeing it as a catastrophe, he wanted to see it as an opportunity and he did it. Luke: Did you meet Yashar Kemal? Burhan: He sent me a message through a friend that I should ring him. ‘Why haven’t you called me so far?’ he asked me. It was kind of scary. I said, ‘How can I call you?’ He said ‘Boy,’ in Kurdish. He liked to use certain Kurdish words. He said ‘Hey boy, you come and see me tomorrow morning ok.’ It was an order. Luke: I’ve got to dive into this. What was he like? Was he a nice person? I have no idea. Burhan: He was amazing. He was like the grandfather you’ve always wanted to have. Luke: You have no idea how jealous I am now. Which is your favourite of his books? Burhan: I think… I can think of certain books, but if you ask me tomorrow I will have a different answer. Luke: What’s that in English? Burhan: The birds have gone too. Luke: Oh yes. The Birds Have Also Gone, that's mine as well, the one with the boys in Florya. Burhan: Yes. Also one of his books is the legend of the Bulls (The Legend of the Thousand Bulls ed. ), I don't know the title in English. There are so many books and Ince Memed of course. Luke: Of course. Apart from Yashar Kemal, who are your other influences? Burhan: There are so many writers in Turkey. Like you said Sait Faik, Ahmet Hamdi Tanpinar to me are kind of knights of words. They were very brave. I believe they had a certain type of talent. Turkish poetry in the twentieth century was very strong for example Nazim Hikmet, Ahmed Arif, Turgut Uyar, Gülten Akın. While I was a teenager, because, as you know, translated novels are very common and very popular here, I read a lot of foreign literature: French poetry, Russian classics, modern English writers and that kind of literature was always part of my life. Luke: Thank you. I’d like to talk about PEN now if that's alright. Luke: For people who don't know what PEN is can you describe it? Burhan: PEN is the organisation of writers, essayist, novelists, and poets. It’s nearly one hundred years old. In three years’ time we are going to have our centennial. We’ve got more than one hundred and fifty centres all around the world. Our centres are independent. They are not branches of PEN international, they are free entities, but every year, we come together. Last year our congress was in Ukraine and this year it will be in India. Writers come from all around the world and we discuss our needs and problems. PEN International is focused mainly on two points: one is promoting literature, secondly, when literature is in danger we defend freedom of expression. Those two points, freedom of expression and promoting literature are the key points of PEN International’s activities. Luke: What is your role in the organisation? Burhan: Apart from being a member of English PEN and PEN Turkey, currently, I’m a board member of PEN International. Because I live in Turkey, people think that I’m a part of Turkish PEN. I don't have any position on that board. Within PEN International we deal with the needs and problems of PEN centres all around the world. Writers are in danger so are journalists and academics not only in Turkey -Turkey is unfortunately very popular nowadays- but from Saudi Arabia to Mexico, from Russia to Eritrea. We have to perceive all those places with, of course, our local ties. Luke: Part of what you do with PEN is helping writers who have been arrested. I was wondering if there is a theme running through there from your work with PEN to Istanbul Istanbul, which is about prisoners? Burhan: No because when I was writing Istanbul Istanbul, I didn't have any active connection with PEN. When I was writing that book maybe five years ago, I was a member of English PEN and after that book was published I was offered a position at PEN International. Luke: I see, so it was the other way round. Burhan: I didn't find them. They found me. Luke: How effective do you believe PEN to be and how do you measure if you’ve been successful in your stated aims? Burhan: This is just my personal opinion. We shouldn't be very expectant about these sorts of organisations. We can not bring everything into reality. But we can show one thing in this world. Nobody is alone. When my writer friends or journalist friends are in prison, they know that they are not alone, in Istanbul or the world. When a journalist is shot dead in Mexico, other journalists know that they are not alone in this world. We always support and help each other. I think that this is the main thing PEN can do. On the other hand, we have influence over governments and international institutions. Luke: So you think it’s more about the support than any one political outcome? Burhan: Yes and defending principles. Luke: So how do you select a writer to be protected? Burhan: There are different processes. There are thousands of writers who need our attention. We deal with everyone at the local level, but at the international level we also have a case list of, let’s say, about one thousand writers around the world and we follow their cases very closely. Luke: So what sorts of tactics do you use to help writers? Burhan: Writing statements, petitions, protests on the streets, going in front of embassies and meeting high-ranking politicians, EU officials. We do everything. There are no limits. Luke: So if somebody wants to help PEN out or is sympathetic to this cause what can they do? Burhan: There is one simple way. They should connect with their local PEN organisation. Luke: We can’t talk about PEN without talking about the problems in Turkey right now. I was wondering if saw the letter from the Noble laureates to the president about the Altan brothers? Luke: Do you think that this kind of action has much effect? Burhan: Yes. That kind of letter shows that writers support each other. In this world, big financial corporations support each other, or arms dealers support each other or corrupt politicians support each other. They should see that writers also support each other. You can sentence a certain writer to prison that will not make us scared. Still we will help each other and we will never step back. That's the point. Luke: I’ve got a difficult question now. Should Orhan Pamuk have signed the letter? Or, would you have signed it? Luke: Another difficult question. You have been a political exile before. Are you worried that your work with PEN might cause problems for you? Sorry if that is too personal a question. Burhan: It’s ok. I’m very much worried, concerned and I’m scared. But that doesn't mean that I will step back. Luke: How do you deal with those feelings? Burhan: Bravery is not being away from fear. If you want to follow your intellect and your conscience and you do what is necessary, then people call it bravery. It’s not bravery. It’s just normal act of human personality. And, it is a choice you make. Luke: Burhan Sonmez thank you very much for talking to me.